Andhra Pradesh State Council of Higher Education (AP SCHE) released the AP EAMCET Syllabus for the candidates who are applied for the AP EAMCET 2019 notification. This is the entrance exam for the students in different colleges in Andra Pradesh. 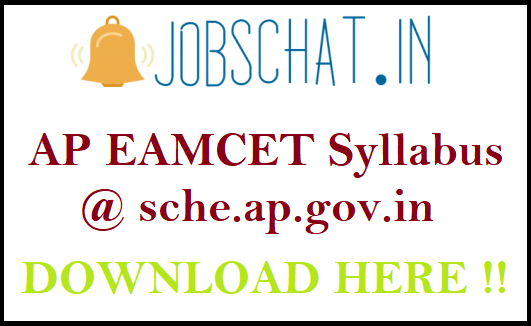 For the seek of students the officials of the Andhra Pradesh State Council of Higher Education published the pdf of AP EAMCET Syllabus 2019 in online. The candidates can download this pdf from the official website or you can avail from here at Jobschat.in. So Download the Maths Physics Chemistry Syllabus for AP EAMCET 2019 and qualify in the Entrance exam. Then go to the homepage. Open the syllabus 2019 pdf link. Click to Download the link in pdf format. Copy and save to your PC or laptop.